All turnip greens have some bitterness due to their high mineral content. Mature leaves and those of plants that are flowering or going to seed are more bitter than young greens. The high mineral content of turnip greens is a nutritional plus, but can require combining them with milder greens or using special seasoning to make them palatable. 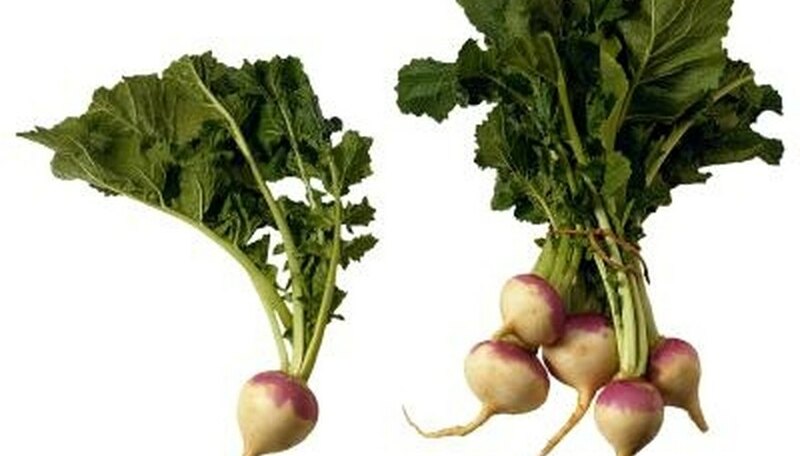 Turnips are members of the Brassicaceae plant family, which includes cabbage, broccoli, mustard and kale. All members of the Brassicaceae (sometimes referred to as cruciferous plants) are noted for their high mineral content. Within that group, turnip greens are among the highest in minerals. They have twice as much calcium, for example, as mustard greens. Many minerals have a bitter taste. The bitterness of turnip greens is a sign of their high nutritional value. Turnip greens grown in full sun tend to have a stronger pungency and bitterness than those grown in partial sun. Turnips grown in partial shade do not develop root vegetables as large as those grown in full sun. Young turnip greens have less bitterness than mature leaves. Turnips can be planted closely and thinned during the growing season. The thinned plants can be eaten for their mildly flavored greens. Cooking turnip greens in boiling water and then discarding the water reduces the bitterness of the leaves. Some recipes recommend cooking them in a second pot of boiling water to further reduce the bitterness. However, much of the nutritional value of the turnip greens is lost to the water they were boiled in. Steaming, stir frying or adding to soups are methods that preserve the high mineral content of the greens. The bitterness can be reduced with balanced seasoning. Combining turnip greens with strongly flavored seasonings reduces the bitterness of their taste. Garlic, hot peppers, bacon, lemon juice or vinegar are traditional seasonings for turnip greens. Fats including olive oil work well to tame bitter flavors, as does including some salt in the recipe. Turnip greens combine well with Asian seasonings including soy sauce, ginger and toasted sesame oil. Adding a small amount of a sweet ingredient such as honey also reduces bitterness. Leda Meredith is the author of two books, including "The Locavore's Handbook: The Busy Person's Guide to Eating Local on a Budget." Specializing in wild edible plants, she is also an instructor at the New York Botanical Garden and the Brooklyn Botanic Garden.